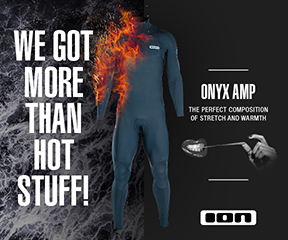 Windsurfing is about harnessing the elements but one of the greyer areas of our sport that people shy away from either understanding or even experimenting with is the tuning of our kit. On my Coaching clinics I teach basic tuning straight away; board setup and making easy changes to the rig, like boom height or outhaul tension. This forges independence and experimentation and begins the self-coaching and resilience I like to foster in my students. It even starts before the clinic with an email to say bring some smaller / spare fins for example. 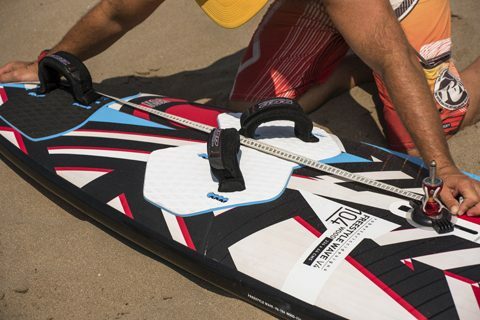 Tuning assists the rider in getting a huge range out of one board, thereby necessitating less board and sail changing and so this month I will look at how to tune the ever-versatile freestyle wave board. Please remember my recommendations as to what to tune and how are a guide. In the art of tuning the goal is experimenting to find out what works best for you! 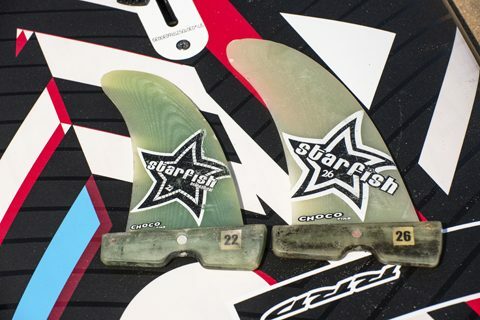 This feature covers FSW tuning as these are not only very popular but they have also now, so to speak, ‘come of age’ with their tri fin setup options alongside their straight shooting single fin predictability. They were already chameleons but now even more so. • Footstrap size – I have banging on about it for some time now so please note the term ‘footstrap’ and not ‘toe strap’. 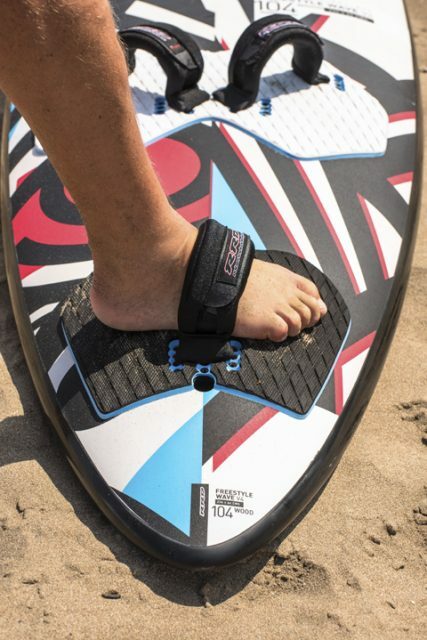 Note if these (inboard) straps feel big when blasting you can edge your foot out of the strap to help lock down the rail, and thereby the board. 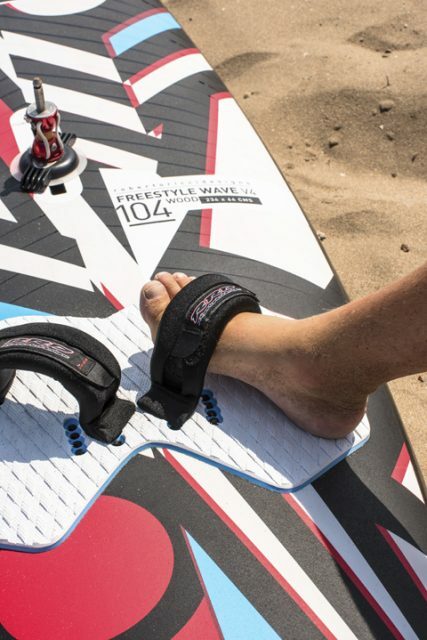 Bigger footstraps help you carve, jump and slip your feet in and out smoothly. captions but in brief, a wide spread will give control, an inboard position for carving and outboard for blasting. 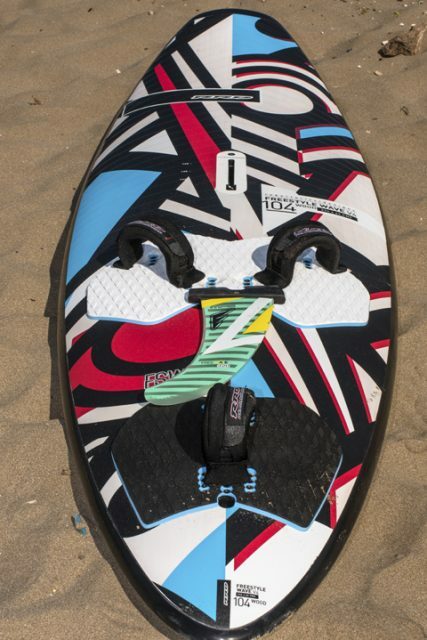 • Fin Size – This feature covers FSWs but even freemove boards could see you running 3 different fins to great effect. Increasing fin size ups the lift and assists early planing and upwind sailing. 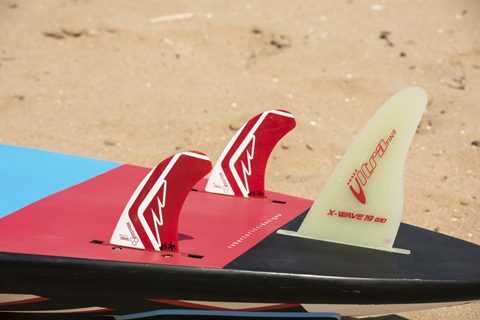 Decreasing fin size lessens the lift and helps the board to become more controllable and manoeuvrable. On a lot of FSWs our choices are; run with the often-bigger stock single fin, size down the single fin or switch to a tri fin setup. It can be said that changing fin size can be like changing sail size; again increasing the board’s wind range and application. An inboard position and generous size allows your ankles to bend so you can drive into carves and release your feet easily for transitions. 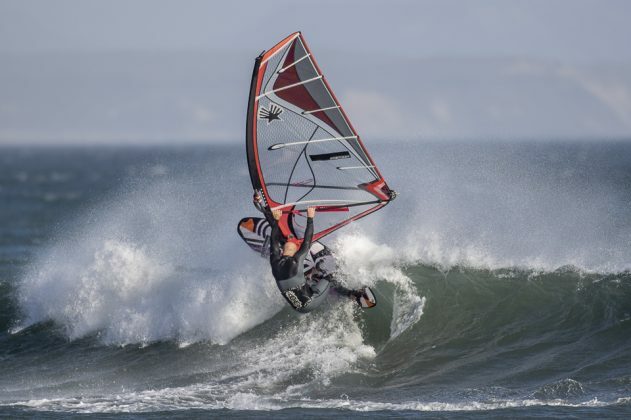 The proximity to the centreline also makes the foot change in the gybe smoother and for the rider to lift the upwind rail in the air for jumping, thereby feeding air/lift under the board.’ PHOTO N.Jones. This highlights how the single generous back strap facilitates ankle dynamism and getting your weight over the toeside rail. 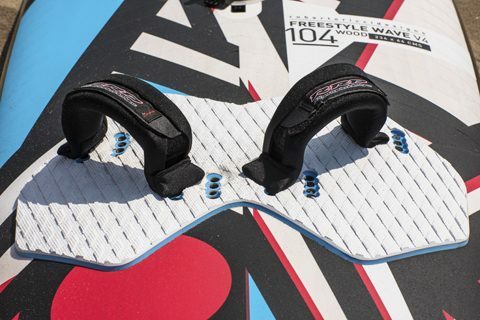 This will assist windward rail lifting for jumps, carving hard whilst strapped in for wave rides and flat water 360s and for busting through lulls without sinking the upwind rail!’ PHOTO N.Jones. “The strap spread that works best for you comes from your stature and preference. Measure from the back of the front footstrap screw to the front of the back footstrap screw. As a guide the range is around 38-44cms. Shorter (height and/or leg length) riders suit a narrower spread and taller riders go wider. For a point of reference this might be the front strap being on #2 hole and the back one on #4 (the very back hole) for me. The shorter rider can bring the front strap back and / or bring forward the back strap. Experimentation and knowing the measurements are key.’ PHOTO N.Jones. • Situation: The rider is sailing in and the board’s nose is looking to rise, alongside the windward rail getting a bit unwieldy. 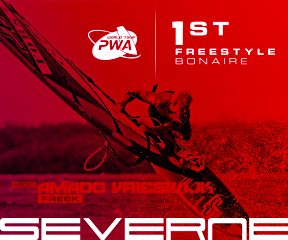 As they try to gybe the board it will not turn downwind easily and has problems holding the carve. • Solution: They are overpowered and their fin is too big. Options are to increase outhaul and size down the fin in order to decrease the fin lift and help the board become more controllable and able to turn/carve. • Situation: A rider is looking to get planing and get upwind and also make some chop hops, or even learn to forward loop. The board appears to have no drive or pop. • Solution: Whilst looking to up their game they have simply gone too small on the fin size. They need to upsize the fin; even from 22 to 26 cms can make a big difference. This will give them easier planing and pop so they can try more moves! 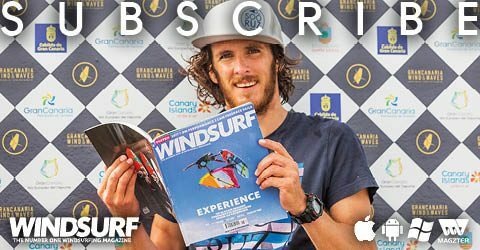 • Situation: A wannabe wavesailor is looking to get into wave riding and despite their best efforts on a suitable wave, the board (their FSW), is just not turning responsively. • Solution: Their setup is single fin and they have neglected to change their fin to a more responsive tri fin setup. 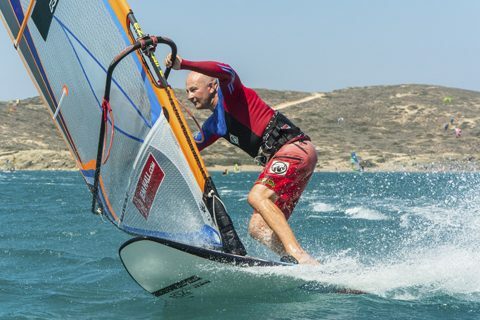 • Situation: A rider is flying around in a fast great stance but the board is not at the speed it should be and is catching chop around the shoulders (in front of the mast foot). • Solution: Modern boards are just so well behaved that sometimes they are just too flat to the water and we need to release them. In this instance it is best to move the mast foot back. The rider may have also fallen for that old tuning classic of ‘put it in the middle.’ Note that sometimes your best mast foot setting may be at the back of the mast track! ‘Two change down fin options for a FSW 104 that I favour. I would use the stock 32cm fin for very underpowered 5.8 sailing or for my 6.4. As soon as I’m flying on a 5.8 or smaller I want to be on the 26cm fin. This means I have to work a bit harder to plane and get upwind, but the benefit of better carves and boosting more air easily far outweighs the required focus on my fundamentals. The 22cm is for windy / bumpier waters and some tricks. It means I can use a 5.3 or 4.7 on the 104 when required. Sailing a smaller fin makes us more sensitive and so when we go down to smaller boards they feel, well, less small. As a 90 kgs rider I favour bigger boards, medium sails and fins that are not too big. Look to find your preferred setup and benefit from having more fun and perhaps learning more.’ PHOTO N.Jones. 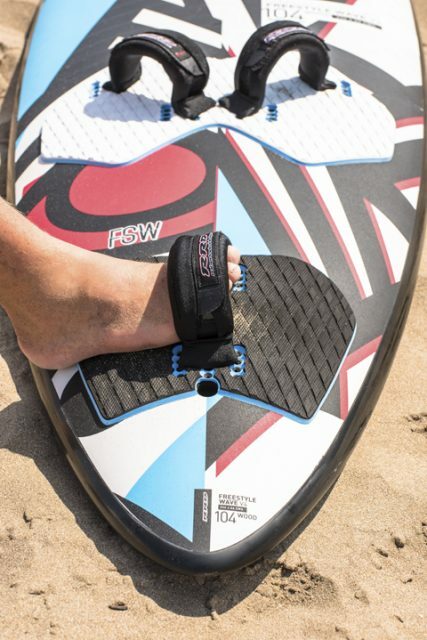 ‘Setting up your FSW with its tri fin option gives you even more control in stronger winds and bumpy water. It will also help you to go into the waves and be able to wave ride more easily when well powered up. Note that when your board is in single fin mode the outside boxes should have ‘box covers’ in place to keep the water flow efficient. • 6.4 on my FSW 104. 6.4 x 5 = 32cm. This is the stock fin size so that is great. • 5.8 on the 104 = 29cm. I need less fin and my ability is not bad and I want to carve hard so I’m down to a 26cm fin. • 5.0 on bumpy to flat water and we are down to 22-25cm fins. • Freemove example – 7.0 on my 110 and a 95 kgs client wants to try my board. 7.0 x 5 = 35cm, but they want to get going easily so I reach for my 40cm for them. ‘To get a feel of where your mastfoot should be you can make a mark on your mast track by taking a measure from the back of the board to 130cm from the tail, or use (double check) the markings that might already be available. Small movements in the range of 128-132cms can often yield excellent results. It is worth noting that riders often move their mast feet forward but rarely rearward for good effect. Also moving your mastfoot back will require you pull the kit more down into the water, often with a bent back leg. Therefore you are required to improve your technique to benefit from the looser feel and more available pop of a more aft mast foot. On the other end of the scale, when it is blowing hard, simply moving your mastfoot forward 2cms can make a huge difference, as this drops the nose and your body position. RRD boards, wetsuits, softwear, Ezzy sails sponsor Jem Hall. Get him live and direct on one of his highly acclaimed coaching holidays. You can also follow him on twitter / Facebook and Instagram.